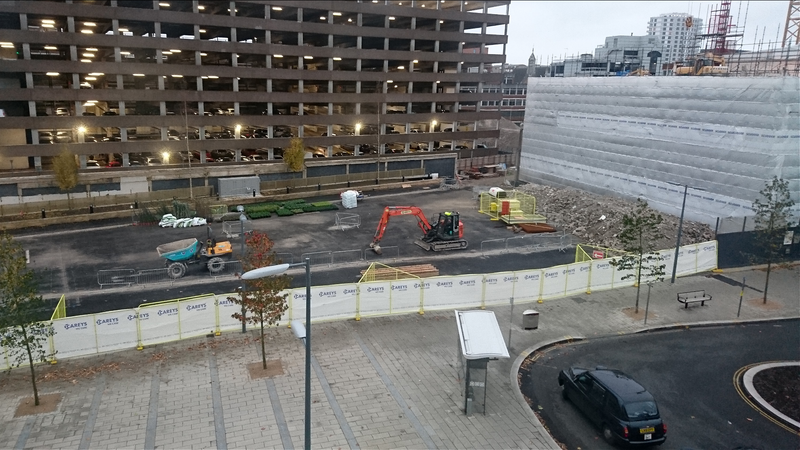 After many years of talking, planning and re-planning, there’s finally a flurry of building activity around Reading station, as the town’s skyline continues its rapid evolution. The work is centred around Reading’s two office buildings bearing the word ‘Tower’ in their name: Western Tower and Thames Tower. The two, however, have met very different fates. Western Tower, or “Great Western House”, was built in 1970. At 58m, it has dominated Reading’s skyline for a generation, yet it’s been empty and defaced by graffiti for two decades. Part of the Station Hill regeneration project, there have been several iterations of plans for the site, all of which include the tower’s demolition, along with its adjoining low-rise shopping parade. At one stage John Madejski bought the property, but now his Manhattan-esque proposals, along with his ownership of the land, have been heavily diluted. Nevertheless, the revised scheme still constitutes a huge investment and redevelopment of an ugly corner of town. Offices, shops and flats will transform the area to a bustling new quarter, and provide a thoroughfare from the station to Friar Street. Earlier this year the Western Tower was shrouded in plastic sheeting, and a gradual, low-key demolition is now almost complete. So what of the proposals to replace the 17-storey office building? 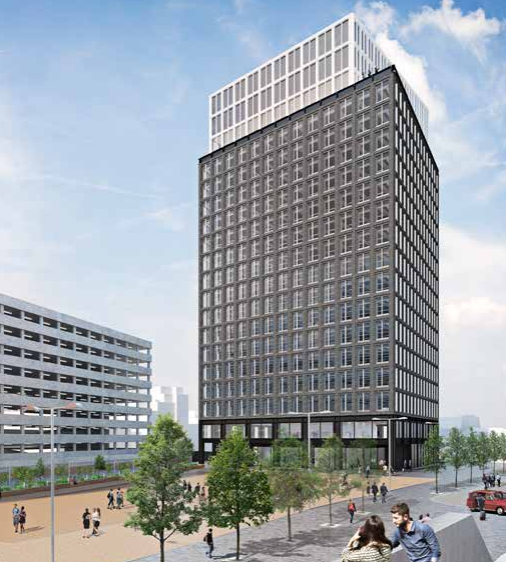 Well, the developers have been very creative and really pushed the boat out by unveiling proposals for… that’s right, a 17-storey office building. 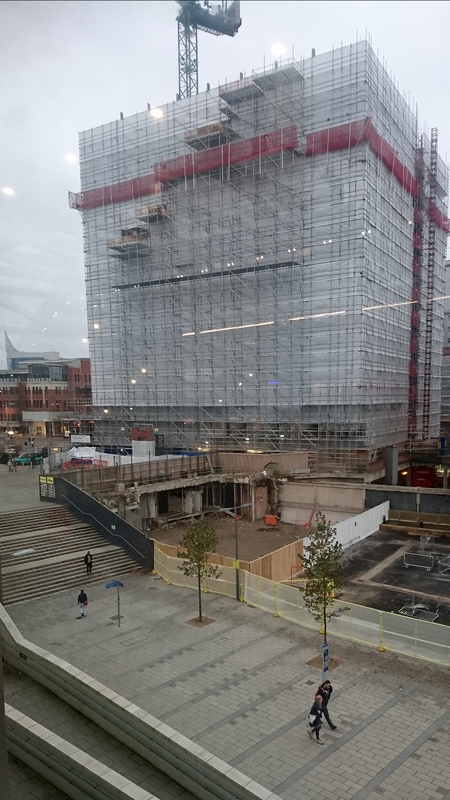 The new tower is currently known as “Building B” – the developers appear to have been afflicted by the same inability to name their creations as suffered by the council with their bridge with no name. Building B, however, is much larger than its predecessor, occupying also the adjacent former Top Rank dance hall site, and reaching a further 20 metres into the sky due to the significantly higher ceilings that modern occupiers demand. It’s easy to mis-interpret the plans on the council website, with diagrams annotated with 119 metres. However, usefully enough, this is actually the height above sea-level, with the base – and central Reading’s typical ground level – being around the 40 metre-mark, leaving a tower of some 80 meters, which will be Reading’s tallest (if you discount the flag pole on the top of The Blade). The area cleared by the Station Hill shopping parade will ultimately accommodate a larger office building, but not for potentially another decade whilst the remaining plots within the Station Hill project are developed. Hopefully, by then the proposals for this centre-piece plot can evolve into something a little taller and more slender than the bulky-looking building in the concept images. But in the meantime, pleasingly, the area will be tidied up, some planting added, and then used as an open square for events. There’ll be a small cafe building within this temporary scheme, which has managed to acquire a name, and a rather good one: The Biscuit Tin, evoking Reading’s Huntley & Palmer heritage. No details yet on specific plans for events at the venue, but I’d expect to see a Christmas Market and ice rink here this time next year instead of at Forbury Gardens. Meanwhile, the prominent brown-glazed Thames Tower has also been shielded from view. Similar plastic sheeting protects its modesty whilst it’s stripped back, re-clad and extended upwards by four floors. Built in 1974, the tower’s design and larger footprint have presumably swayed the economics in favour of refurbishment, sparing it from the demise being suffered by its only slightly older neighbour. 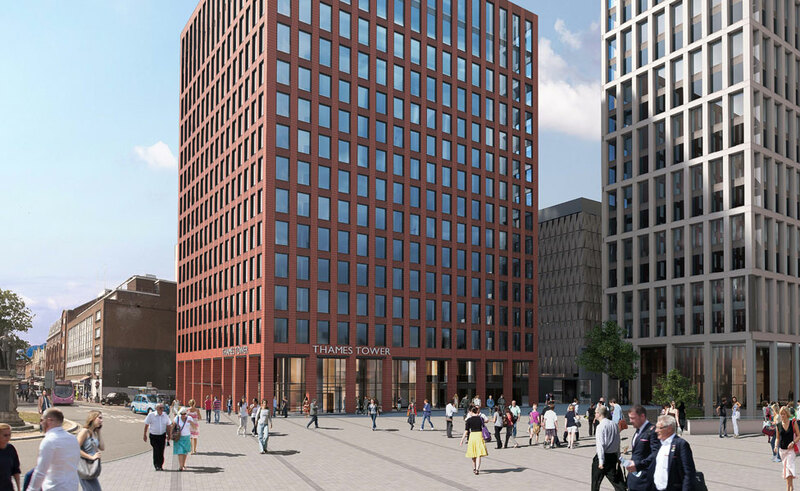 The spruced up tower will be terracotta red – a finish more in-keeping with Reading’s prevailing architecture. The two schemes join a number of other high-rise developments in the town centre, as Reading continues its drive upwards at an accelerating pace, with ever taller buildings. The coming arrival of Crossrail makes it hard not to see this trend continuing. Although, by way of balance, if you prefer the sea-level measure, then even after the extension of Thames Tower, and the construction of Building B, it’s in fact Christ Church, with its elevated plot at the top of Kendrick Road, that clings onto its status as Reading’s highest rooftop – a position it’s held since 1864. So perhaps things aren’t changing quite as fast as we sometimes think.